Single mum Nadia is getting used to life as a HEN (happy empty nester) after her teenage twins head off to different universities. After an initial period of getting used to the silence and cooking for one, and the inevitable worrying if Alfie and Molly are managing okay, she soon settles into her new way of life. During a very funny encounter in a Lush shop, she meets charity shop manager Jack and they begin a relationship. With no children around to cramp their style, they revel in the freedom to enjoy themselves. Until, one evening, Alfie unexpectedly arrives home and almost catches them in what would have been a rather embarrassing situation! Well, the way house prices are around here, I can’t see myself being an happy empty nester anytime soon! One of my girls is at Uni but staying at home and the other is due to go after summer but hoping to stay at home too. I’m not complaining, I enjoy having them around and it’s certainly a lot cheaper. But I couldn’t help but sympathise with Nadia though, as Alfie not only put a damper on things with Jack but also seemed to have acquired lots of annoying bad habits such as not flushing the loo and leaving the tv on all night. I did get rather irritated with his selfishness at time but also with Nadia who I felt was far too tolerant of his behaviour. As any parent of teenagers knows though, it can be tricky finding the right things to say and do and there is always the worry that too much pressure may have awful consequences. I liked how the story was told not only from Nadia’s point of view but also from Jack’s. We got to see how he was feeling about the whole situation and his mixture of understanding and frustration at what Alfie’s arrival home and bombshell announcement did to his and Nadia’s relationship. There was a bit of intrigue with him as we learned he had a secret in his past regarding a family member. As I wondered what this was, I couldn’t help but feel sorry for the guilt he carried. 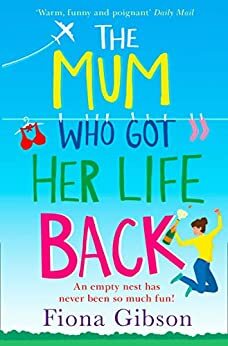 The Mum Who Got Her Life Back is an entertaining and amusing read, with lots of make you smile and lots of situations that any parent will identify with. It shows many different kinds of family situations and how they can be complicated with second relationships. But it also shows how with a bit of compromise, they can work for everyone. I was so hoping that things would work out for Nadia and Jack as they seemed lovely people who deserved happiness. Whether it works out the way I’d hoped, you’ll need to read for yourself to find out. But for all you mums (and dads) out there who wonder if they will ever get their lives back, this book offers hope that there is light at the end of the tunnel. And more than a few smiles! Fiona Gibson is the author of ten novels, including the best-selling The Woman Who Upped and Left (Avon). She also writes under the name Ellen Berry – The Bookshop on Rosemary Lane is the first in a series of three new heartwarming novels sparked by her obsession with cookbooks, and inability to stop buying them. The Ellen Berry series will follow the adventures of Della, who opens her very own bookshop, plus her fashion journalist sister and the customers who grow to love the shop. Fiona grew up in a Yorkshire village called Goose Eye, before working on Jackie and Just Seventeen magazines – in those heady pre-internet days when it was pretty exciting to get a free plastic mirror taped to the front of your magazine. She went on to edit More! magazine where she introduced the infamous Position of the Fortnight. After having twin sons and a daughter, she started to write novels, usually at night with the house full of toddlers and builders. She was sleep deprived anyway so it really didn’t make any difference! When she’s not writing, she’s usually drawing, painting or reading, or out walking or running in her home town of Glasgow with her collie cross, Jack. She’s a pretty poor speller but loves nothing better than starting a brand new book. The end bit is fun to write too. It’s the middle part that’s the tricky bit.